Happiness in marriage and family life comes from doing what makes loved ones feel appreciated. In Dr. Gary Chapman’s best-selling book, The 5 Love Languages, we discover what makes others feel loved. 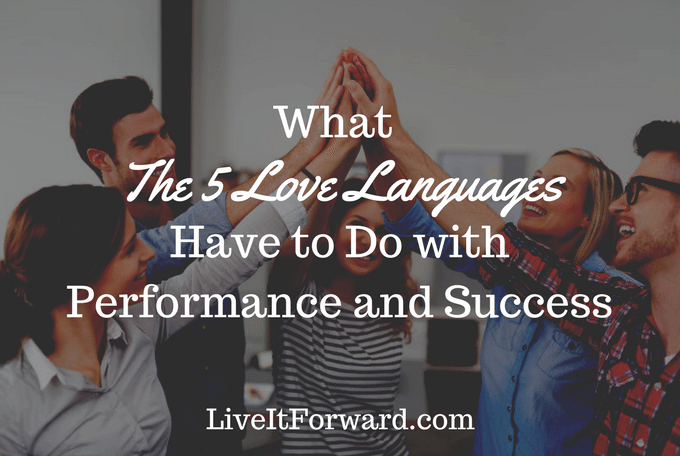 What do the five love languages have to do with performance and success? Everything! High performance comes when a person feels valued, important, and respected. With high performance comes success. In episode 052 of The Live It Forward Show, Kent Julian tells how the 5 love languages can bring success and performance to your career and family life. Do you want to get paid to speak? Check out Speak It Forward for more information. Are you tired of being held back from your dreams? Release the Brakes! Thank you for listening to this episode of The Live It Forward Show. Do you have any feedback, questions, or ideas? Feel free to leave a note in the comments section below. If you enjoyed this episode, share it by using the social media buttons at the top or bottom of this post or by clicking one of the tweets above. Sharing is caring! Ratings and reviews are extremely helpful and greatly appreciated! They help with the ranking of the show, and I read every single one of them. Kindly leave an honest rating and review for The Live It Forward Show on iTunes. LIF 081 – Peak Performance Strategy #4 – How Do You Hit Your Peak Consistently? LIF 082 – Peak Performance Strategy #5 – How Do You Maintain Peak Performance? LIF 079 – Peak Performance Strategy #2 – Where Are You? LIF 078 – Peak Performance Strategy #1 – What’s The Point?